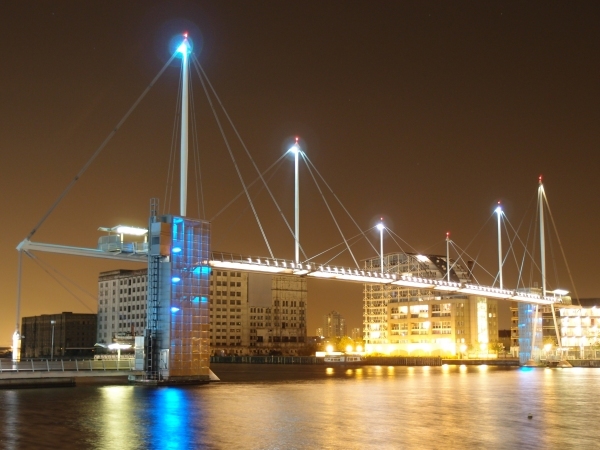 Consulting Structural Engineers, Techniker Ltd, won a competition sponsored by the London Docklands Development Corporation to design a footbridge to span the Royal Victoria Dock in London. 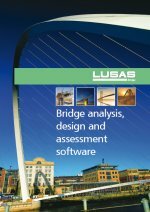 To help evaluate the dynamic response of the structure LUSAS Bridge was used. 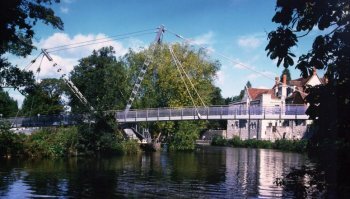 The striking cable stayed design incorporates a pedestrian transporter hung beneath a boom-like central section which also carries a light footway. Deck panel beams, connected to crossheads with spigot joints, are shaped to respond to the applied forces and are drawn upwards into the deck area and behind ballustrades to help reduce the wind signature. 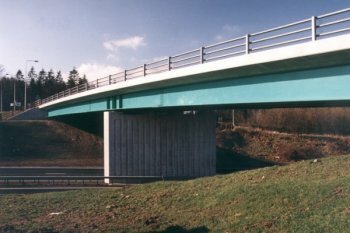 To derive accurate wind loading criteria for use in the detailed analysis a model of the proposed bridge was evaluated in a wind tunnel. Two simultaneous sets of FE models were created in LUSAS Bridge. A detailed local model of the deck panel beams, diaphragms and skins was used to derive properties for an equivalent stiffness or rigidity model. This was made up of cable, beam and shell elements. Small connecting elements were used to model the proposed spigot joint between deck members. The global member loads and deflection envelopes obtained from the rigidity model were then applied to detailed 3D LUSAS models to determine accurate stresses in the monocoque box girders and tapered tubes. The rigidity model was used to assess the modal response of the structure to dynamic loading. In this model, shell elements with the same bending and torsional stiffnesses as those derived from the stiffness model were used. The distribution of mass was modelled by varying the notional thickness of the plates. An eigenvalue analysis was performed using Guyan Reduction and a series of closely spaced mode shapes were found. The first vertical bending mode was found to be at 1Hz, low enough to give cause for concern, so a driving function was mathematically modelled and applied to create vertical accelerations. These were found to be within the requirements of BS 5400 and at an acceptable level for pedestrian comfort. The mode shapes were then used to set up a further wind tunnel test to check the susceptibility of the bridge deck to divergent response. Results showed the bridge to be stable within the designated critical wind speed. After completion the predicted behaviour was checked against the actual structural behaviour by using accelerometers.